Pipe Spring National Monument may be the least well-known of the 24 National Park Service units in Arizona, due in part to its isolated location at the edge of the wide, empty Antelope Valley in the Arizona Strip, cut-off from the rest of the state by the Grand Canyon, and separated from Utah by the Vermilion Cliffs. This stretch of high desert has long provided a route for cross-country travelers who pass between the great gorge to the south and the escarpments and mountains to the north, and historically, this remote, far northwest corner of Arizona has more in common with Utah. 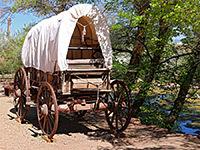 The region is the last outpost of polygamy as practiced by breakaway groups of the Mormon church, especially in Hildale and Colorado City, 17 miles northwest of the monument. 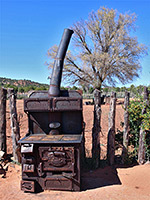 A reliable water source is a rare feature in this generally dry and rather barren country, but early Mormon settlers found such a supply in the mid nineteenth century, about ten miles from the Utah stateline on land which now forms part of the Kaibab-Paiute Indian Reservation. Over the next few decades the spring became the focal point for various buildings and eventually a small fort (named Winsor Castle after its constructor, Anson Perry Winsor), intended to protect the spring and neighboring cattle grazing lands against Navajo raids from the south, although this threat did not materialize, and the defensive capabilities of Pipe Spring were never tested. 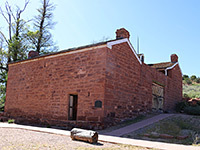 Instead, the fort was used as a ranch house and later as a private residence, before the settlement became the centerpiece of Pipe Spring National Monument, created in 1923. Now, the fort, outbuildings, and various agricultural relics are preserved, and serve as an interesting illustration of pioneer life. The name of this location originated when Mormon pioneer William Haynes Hamblin demonstrated his shooting abilities beside the spring by hitting, at a distance of 50 paces, a clay pipe belonging to his companion Dudley Levitt. Few people visit Pipe Spring National Monument, perhaps not surprisingly as the national parks nearby are rather more exciting. For those passing along nearby AZ 389 though, the fort is well worth a diversion for an hour or so. First stop should be the visitor center, where guests are encouraged to watch a ten minute video that explains the history of the Pipe Spring area. The staff are friendly and knowledgeable but sometimes give the impression they would welcome a more prestigious posting elsewhere. A paved path leads from the rear of the visitor center through gardens and past areas of crops to the fort and to several other buildings and exhibits. 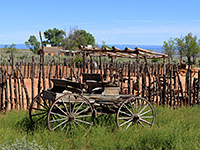 These include a blacksmith's shop, poultry and riding sheds, two ponds with resident geese, an orchard, old wagons, a corral and riding equipment. Other resident animals include Texas longhorn cattle, chickens and horses. Pipe Spring itself is covered by the fort; the water runs underground through pipes and across one room in an open trough before emerging to supply the ponds. An elevated view of the site is provided by the Ridge Trail, a half mile loop which ascends a little way up the red rock hillside south of the fort, past an assortment of desert plants including Kanab yucca and pink-flowered sclerocactus parviflorus; notices describe some of the most noteworthy species. Regular half hour guided tours are offered through the rooms of Winsor Castle, all of which are fully furnished with period fixtures and fittings, the majority donated by local residents and not originally from the fort. The guides are commendably enthusiastic despite presumably giving the same tour several times each day. 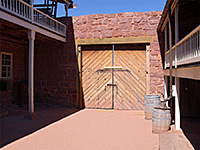 The fort was completed in 1872, using locally sourced lumber and red sandstone excavated from the adjacent hillside; it contains about ten main rooms on two levels, in two sections with doors and windows facing inwards to a central courtyard, all enclosed by a high wall. The upper floors are lined by verandas, linked by an elevated corridor above the main (east) gate. 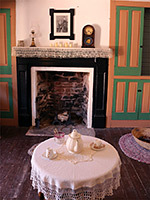 The tour starts in the courtyard, at one side of which is a table displaying an assortment of household artifacts, then proceeds through the parlor and kitchen on the north side ground floor, followed by the meeting room, master bedroom and telegraph room above, then more bedrooms on the opposite side, and finally the spring room and the cheese room below. PDF format maps from the National Park Service. Pipe Spring area map (136 kb). Pipe Spring site plan (224 kb).